Gâteaux 50 recettes simples et gourmandes pour se faire plaisir! Dessert lovers – to your ovens! 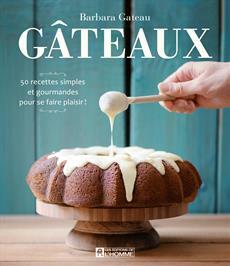 Barbara Gateau has a weakness for easy-to-make cakes, for celebrating (and spoiling ourselves!) on any occasion. In this book, she suggests 50 irresistible recipes including chocolate, spiced, fruity and simply decadent treats. Whether they are layered, upside-down, rolled or fluffy, there's nothing you can't do. Illustrated with the author's magnificent photos, this book will awaken your inner gourmet. - Simply written recipes and techniques even occasional cooks can follow.